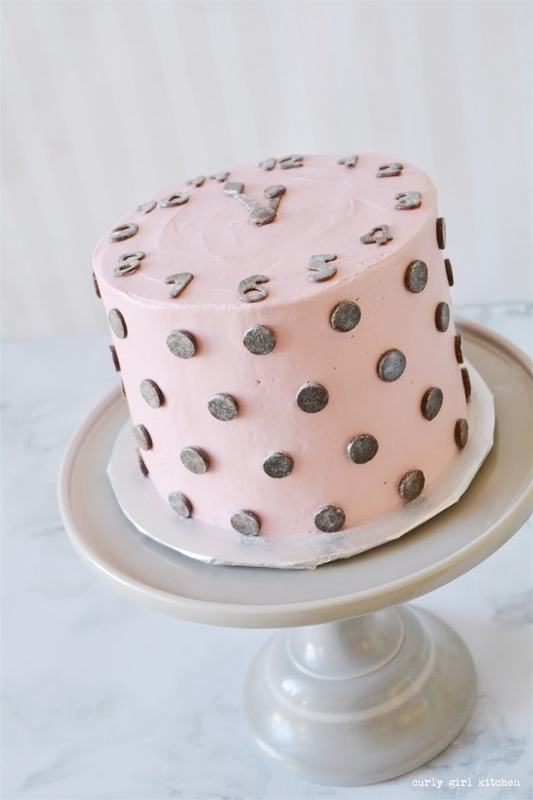 After assembling and frosting your cake, and before the buttercream crusts over, press the chocolate morsels, flat side out, around the sides of the cake for a polkadot pattern. You could also use smaller chocolate chips spaced closer together for even more polkadots instead of the larger morsels that I used. For the clock on top of the cake, just roll out the fondant (which I tinted brown to match the chocolate) to about 1/8 inch thick and cut all your numbers. 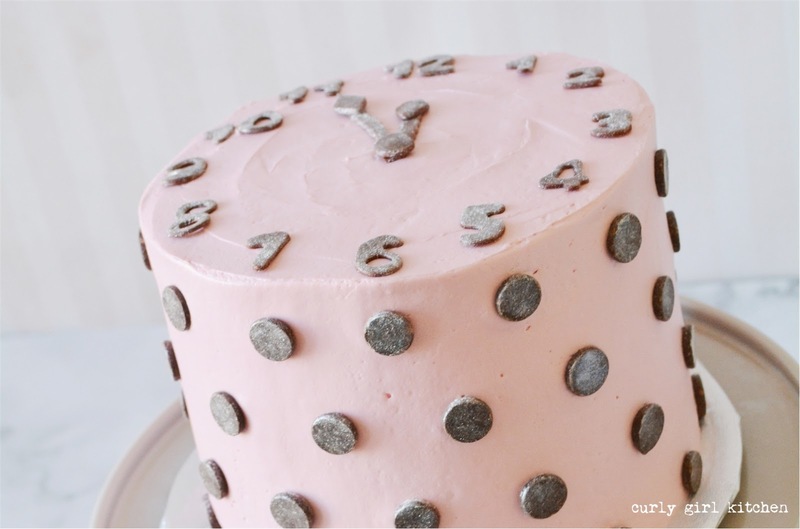 Then, you'll need to use a knife or pastry cutter to just cut free-hand the hands of the clock so that they are the right length to fit on top of your cake. I just cut two thin straight strips, then added a little circle in the middle to join the hands, and a small diamond cutter for the pointed ends of the hands; use a drop of water to "glue" the pieces together as you position them on the cake. 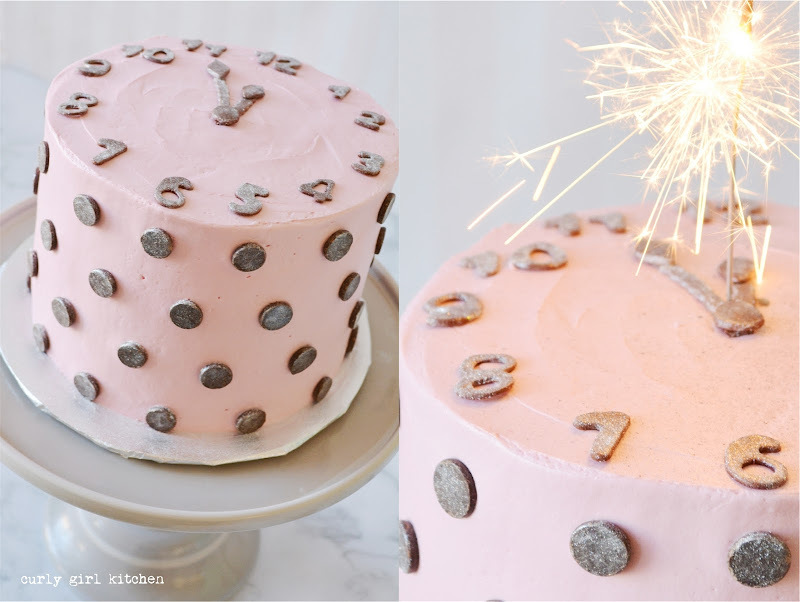 With a small dry paintbrush, brush the shimmer powder over the chocolate and fondant pieces to make everything sparkle, and your cake is done! And it sure makes a beautiful centerpiece for a New Year's Eve party, perfect to serve with glasses of champagne at midnight. 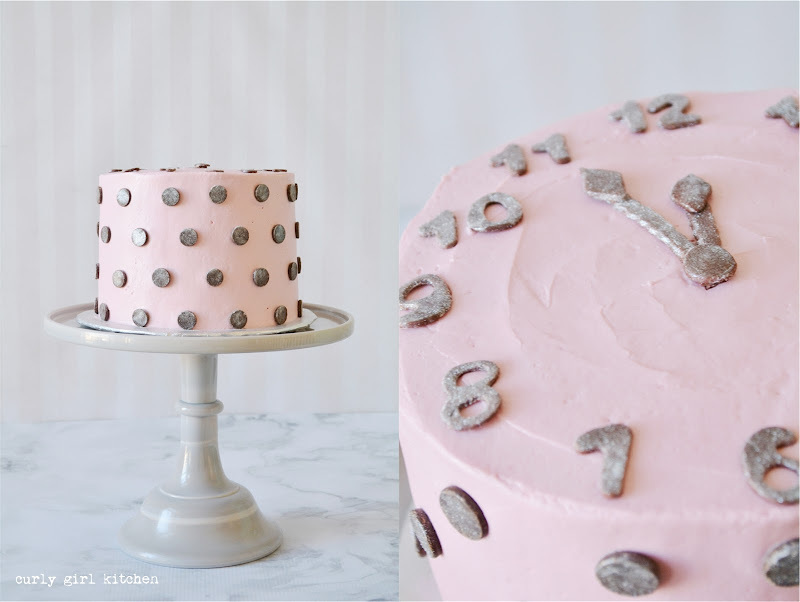 You can even use my recipe for mimosa cake to perfectly complement those champagne toasts! Being pregnant for New Year's (actually for the past three years, I've been either pregnant or nursing on New Year's) means no pitcher of mimosas for me on New Year's Day, so I will just have to live vicariously through everyone else getting to enjoy them this year. 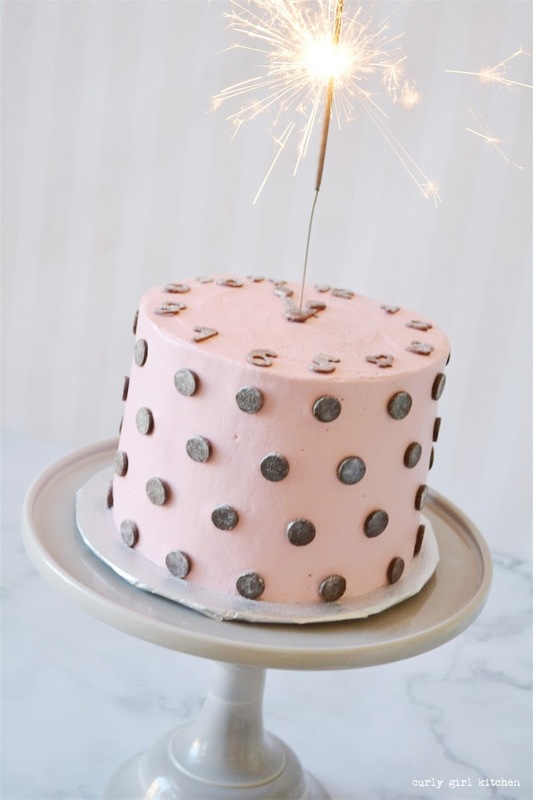 As for the sparkler on top, if you thought you could light a sparkler on top of a cake (because you've seen it done on Pinterest) without covering the top of the cake in ashes that you'd then have to scrape off, well, you'd be wrong. So, take my advice, and just stick with a candle.